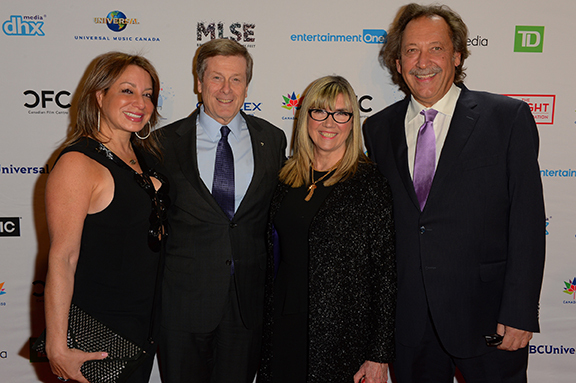 L-R: Kate Alexander Daniels; Mayor John Tory; Christina Jennings; Slawko Klymkiw. Photo: Tom Sandler. 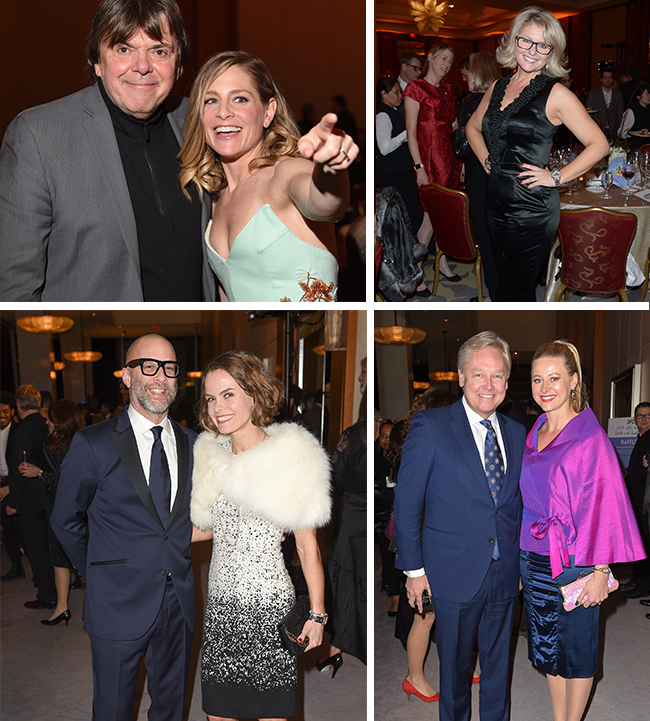 Canada’s top screen-based entertainment talent, luminaries and philanthropists gathered last night for the Canadian Film Centre’s (CFC) 23rd Annual Gala and Auction at the Ritz Carlton in downtown Toronto. A glamorous trip down the red carpet greeted guests, who then enjoyed a cocktail reception, multi-course meal, homegrown entertainment, and both a silent and live auction. This year, the CFC is joining in wider celebrations of Canada’s 150th birthday as a nation. We kicked off the celebrations at the CFC Annual Gala and Auction. 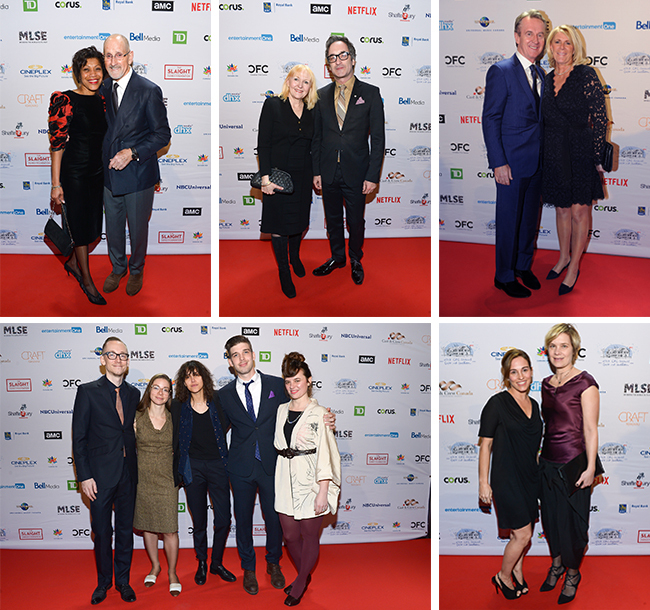 The Gala’s ‘Canada 150’ theme honoured the many compelling Canadian storytellers who have graced our screens and captured our hearts over the years. The Annual Gala and Auction represents the CFC’s biggest fundraising event of the year, and supports the CFC’s range of integrated programs and initiatives spanning film, television, music, screen acting, digital media, comedy, virtual reality, documentaries and more. We want to express our gratitude to our presenting sponsors, The Slaight Family Foundation and Cineplex Entertainment. Thanks to them, and to the generous contributions of the many more who sponsored and attended the event, the CFC can continue to be a globally focused talent, content and business accelerator nurturing Canada’s next-generation storytellers into our nation’s future – ideally, the nation’s Bicentennial! Clockwise from top left: Cheryl Hudson and Michael Say; Sheena Macdonald and Don McKellar; Ron and Sharon Suter; Amy Jo Johnson and Amy Moore-Benson; Slaight Music performers (l-r) Michael Peter Olsen, Laura Barrett, Aimee Bessada, Chris Reineck, Rebecca Everett. Photos: Sam Santos / George Pimentel Photography. The evening got underway with a cocktail reception, which afforded guests a chance to mix and mingle. A plethora of tempting silent auction items lined the Grand Foyer’s walls, prompting extensive bidding. Luxury goods and experience packages offered everything from designer handbags to spa days to exclusive set visits to Canadian TV hits like Orphan Black. Guests peruse the silent auction items on display, including one by beloved local designer Wendy Tancock. Photos: Sam Santos / George Pimentel Photography (l) and Ernesto Di Stefano (r). Some of the evening's delicacies. Photo: Ernesto Di Stefano. Next, guests were ushered to their seats in the Ritz Carlton Ballroom, with tables crowned by specially designed centerpieces by Teatro Verde. The lights dimmed to broadcast greetings from the CFC’s founder, Norman Jewison. He offered his heartfelt gratitude for everyone attending, for the treasures of Canadian culture (especially maple syrup), and for Canada’s capacity to act as a beacon of light through its stories and entertainment. His words led into a montage of some of Canada’s most beloved storytellers from the last 150 years, testifying to how much we as a nation understand ourselves through the stories we share. Gala Chairs Christina Jennings, Chairman and CEO, Shaftesbury, and Michael Kennedy, Executive Vice President, Filmed Entertainment, Cineplex, took to the stage to formally welcome guests and introduce the first performance of the evening. CFC’s own singer/songwriters from The Slaight Music Residency – Soloists Rebecca Everett and Aimee Bessada, with Laura Barrett, Michael Peter Olsen and Chris Reineck – joined forces to perform two songs for the enthusiastic crowd. 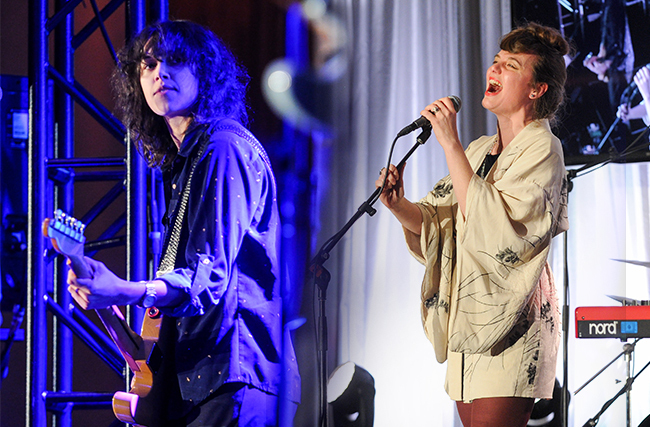 2016 Slaight Music Residents Aimee Bessada (l) and Rebecca Everett (r). Photo: Ernesto Di Stefano. CFC CEO Slawko Klymkiw next made a special announcement, one fitting the performers assembled behind him – The Slaight Family Foundation has renewed its support for The Slaight Family Music Lab at the CFC for another five years. Since 2012, The Slaight Family Music Lab has shone a spotlight on exceptional Canadian musical talent in the onscreen marketplace through its delivery of The Slaight Music Residency, The Slaight Canadian Music Fund and The Slaight Music Resource. Ninety-five per cent of the Residency’s alumni are earning a living by making music full-time, with 82 per cent working in film and television specifically. Klymkiw extended his sincere appreciation for the renewal of support, acknowledging Gary Slaight, President and Chief Executive Officer, Slaight Communications Inc. and patron of The Slaight Family Music Lab. We couldn’t be more grateful or proud. 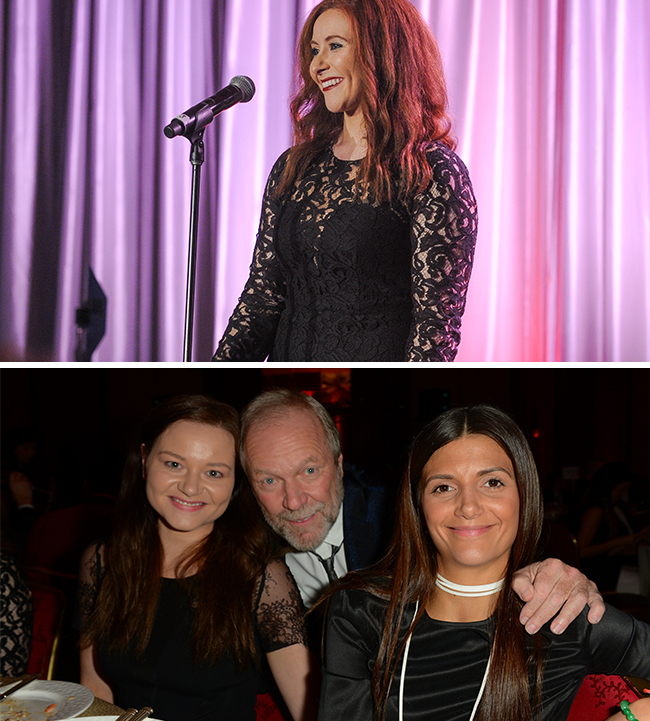 Once the main course was complete, it was time for another musical star to shine – Kayla Diamond, a Slaight Music artist and winner of the Slaight Music 2015 “It’s Your Shot” contest. No doubt this deft singer-songwriter would have made an excellent lawyer, but we’re glad she dropped law school for music; her velvety voice should be heard far beyond the courtroom. Slaight Music artist Kayla Diamond (Photo: Ernesto Di Stefano); Gary Slaight with Ali and Chrissy Slaight (Photo: Tom Sandler). After Diamond’s performance, our Guest Auctioneer Stephen Ranger kicked off the Live Auction. He kept the bidding active on bespoke packages like the Juno Awards weekend getaway, seeing the Raptors or Toronto Maple Leafs up close and personal, or jetting off to The Walking Dead Season 8 premiere. The Live Auction wrapped with the announcement of our Raffle prizewinner, who won the opportunity to design and host a dream event at the Northern Dancer Pavilion at Windfields Estate. The prize includes a custom meal for 20 by 10tation Event Catering, table décor and event rentals by Event Rental Group, professional serving staff by VIB Event Staffing Inc. and a pre-event planning consultation with the CFC’s Manager of Events. After sampling all the delights of the dessert bar, guests lingered, festive and celebratory. People departed only with reluctance, reveling in the glow of so much Canadian hospitality, memories and pride. We at the CFC extend our warmest thanks to all of our sponsors and donors; please see a full list of who made this night possible here. We also want to thank our dedicated volunteers, staff and the Ritz Carlton for making the evening truly magical. Already, we look forward to another milestone on the horizon – our 30th anniversary arrives next year. Stay tuned! Enjoy the full Flickr gallery of photos of the night here! Clockwise from top left: Randy Lennox and Tara Spencer-Nairn (Photo: Ernesto Di Stefano); Simona Shnaider (Photo: Sam Santos / George Pimentel Photography); Michael and Anita Friisdahl; Daryn Sutherland with Rob Guenette (Photos: Ernesto Di Stefano).